Today’s dressgasm is an interesting choice because I feel that it was originally a late 1850s or early 1860s dress that was altered in the 1870s to continue being worn in that decade’s fashion guidelines. I would classify this dress as a visiting dress, walking dress, etc. That sort of thing. By that, I mean the lady probably wore this dress in the daytime when she intended to be seen by her friends, strangers on the street, and yes, her enemies. Women of the nineteenth century were no different than the women of today with having the desire to dress to impress when they were out and about visiting people, shopping and so forth. I believe this dress is made if lightweight cotton or possibly cotton blended with wool. The bodice may be lightly boned, given the firm shape and long point at the waist. 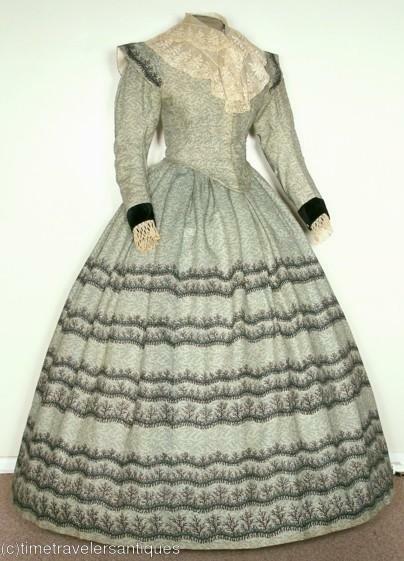 There is a delicate design printed on the fabric and around the sleeve caps are black lace accents with black around the cuffs with ivory lace accents. The reason why I feel this dress may be a blend of several different decades is the fact that the skirt is the classic bell shape of the 1850s and 1860s, while the bodice shape and sleeves don’t exactly fit the standards of those decades. The sleeves are quite tight without an exaggerated elbow and the shoulder seams are higher than what was fashionable before and during the Civil War. 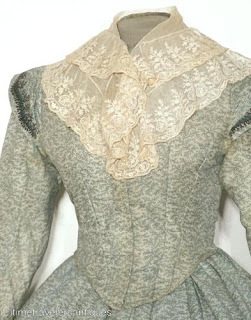 Another clue that the bodice was altered later is the lace draped over the shoulders and over the bosom, which became the fashion in the 1870s. All of these aspects give me a good impression that the dress was altered. Women who were not so wealthy often used and reused clothes as long as they could to make the most of the money they spent on the fabric and trim to make the dress. Since this dress was not silk and the design was not terribly complicated, I do not believe this lady was of any great wealth. This was probably her best dress.